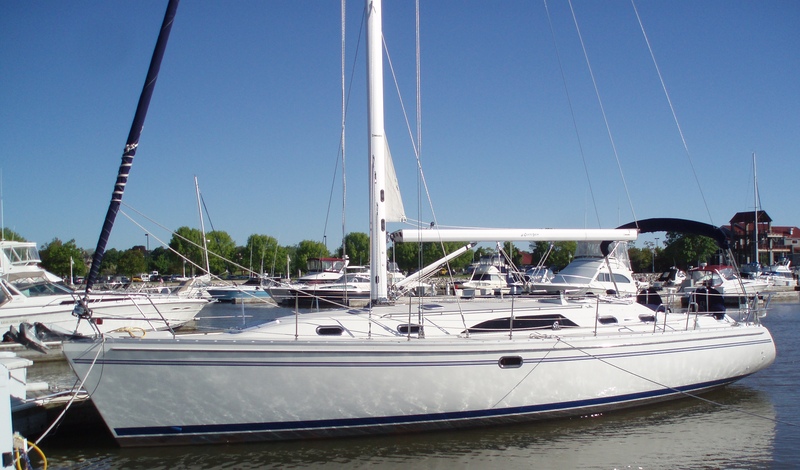 Carpe Diem is a 45 foot Catalina sloop. 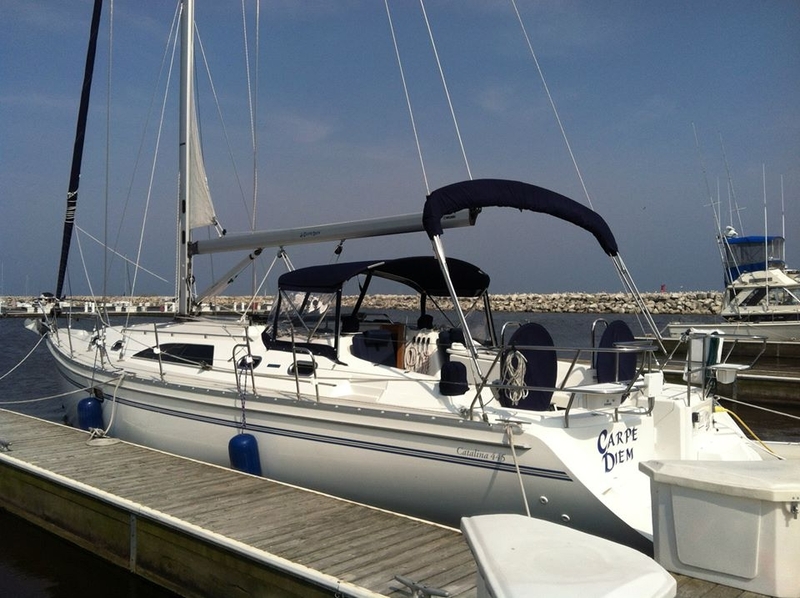 The boat was built in Largo, FL in 2011 and has been sailing the family around the Great Lakes for the past few years. This is our third Catalina (previous 350 and 42 MKII) and we couldn’t be happier with her performance and cruising comfort. She is an ocean series boat and will get her first taste of salt water this year as we make our way south to Caribbean. 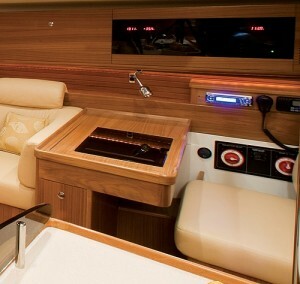 The cockpit is the command center for the boat. 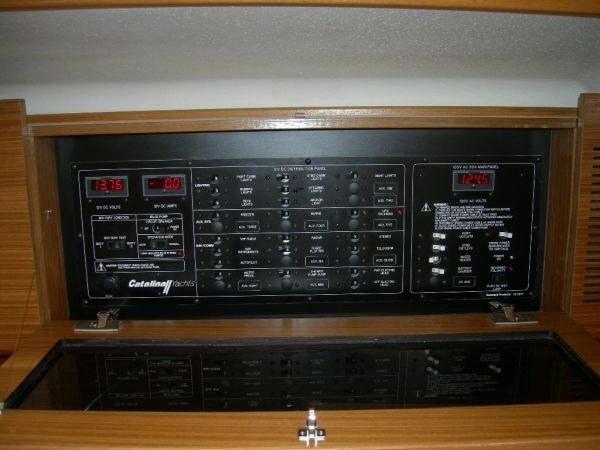 It has twin wheels, engine, bow thruster, sail trim controls, an autopilot, a VHF radio, a stereo, and electronic technology to navigate the boat. The port side salon is the center of interior activity and entertainment. Meals can be served here. It also has the capability of lowering the table and adding a cushion to create an additional birth. Chart Table and Electrical Panel. 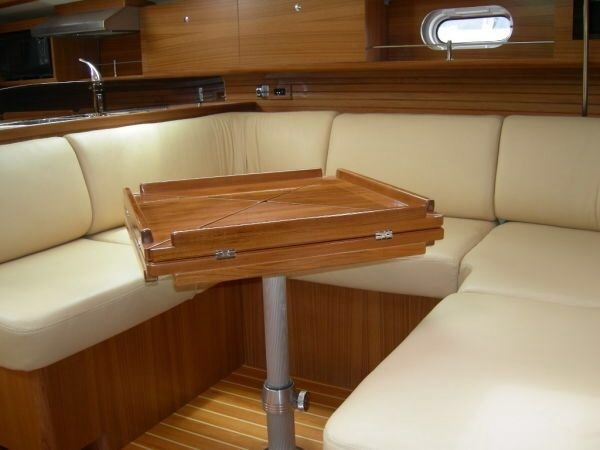 The chart table is where most of the navigational decisions are made. It also serves as a great place to read and write. The dark paneled glass is the electrical circuit breaker. All the 12 volt electrical equipment is controlled from here. It also has a monitor that measures the charge level of the batteries. 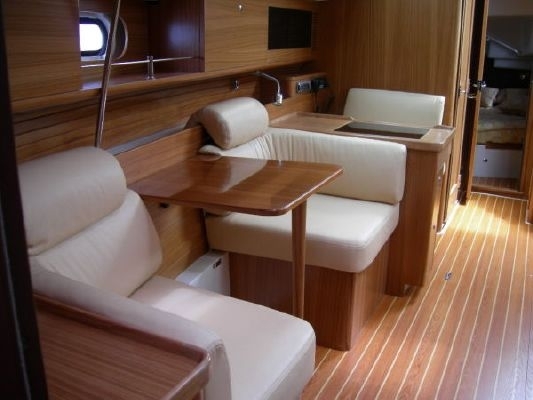 The starboard salon seats are very comfortable. The small table can be lowered, a cushion added, and an additional birth is created. 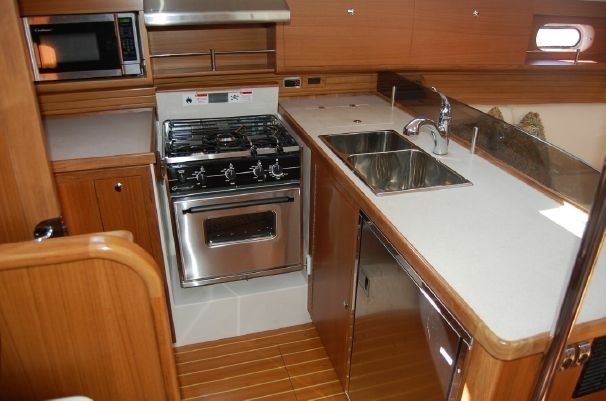 The galley has a three burner propane stove, refrigerator, microwave, two basin sink, and cupboards for coffee maker, pots and pans, dishes, utensils, canned goods, and condiments. 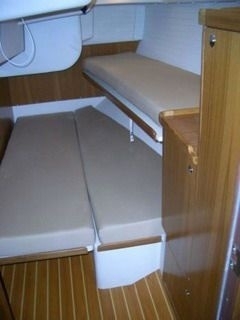 The aft cabin has a standard size bed and hanging locker with its own head. It is located under the starboard side of the cockpit. 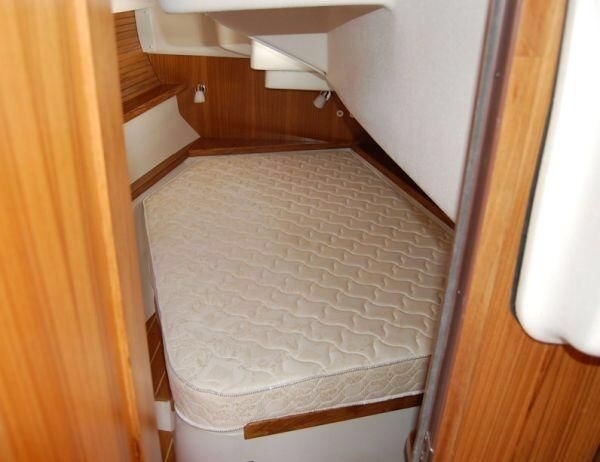 The Flex room was designed to be an additional cabin, a work room, or a storage area. It incorporates a large hatch that opens to the cockpit for easy storage from above. 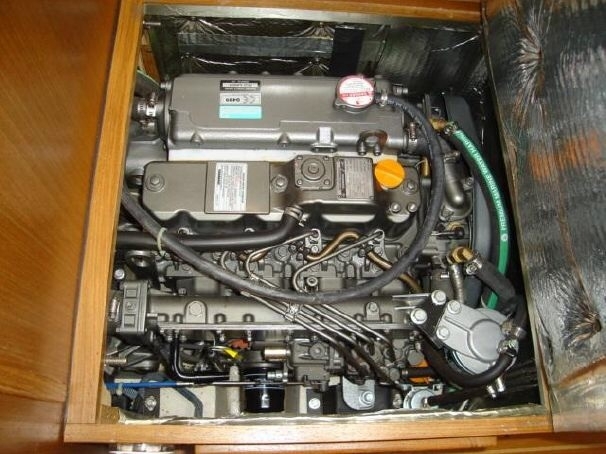 The engine is a Yanmar 4JH5E. 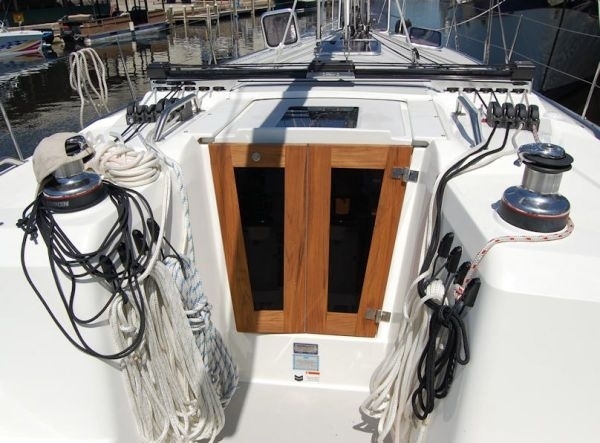 It is located at the base of the transom, between the aft cabin and flex room. 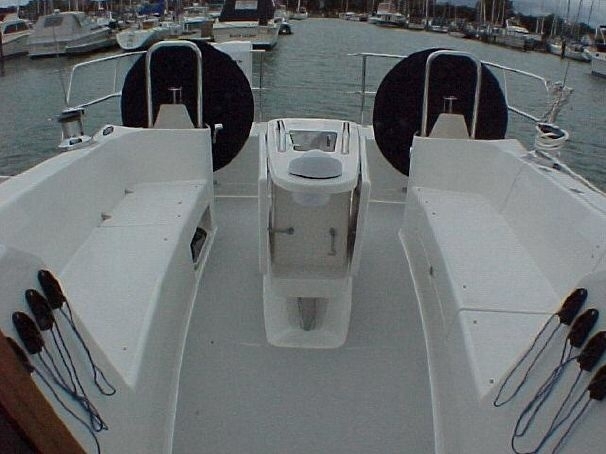 It is a 4 cylinder, diesel engine capable of powering the boat at a maximum speed of 8.3 knots per hour. At that speed it burns 1.8 gallons per hour. 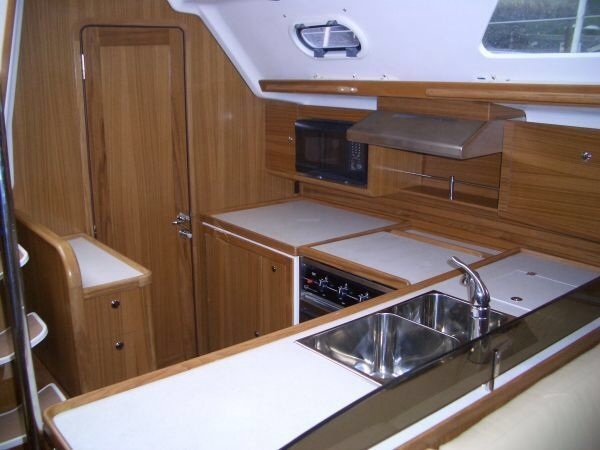 Wow your boat is beautiful ! You and your son are going to have an awesome journey. My husband and I are leaving from Lake Ontario July 1. We have been through the Erie canal before. Bring lots of cheap gloves that you can use to hold the lines and throw away. Have a blast ! See you on the water ! http://www.benger.blogspot.ca is my husbands blog of our refit and journey to this point. http://www.thescubasailors.blogspot.ca is the one I will be maintaining on our journey. Thanks for the note. We’ll keep an eye out for you when we reach the Caribbean. We should be there by December. Stay in touch. Gary, so thrilled to have run into Mindy and quickly brought up to speed on your journey. I look forward to following your journey. Be safe “old” friend from chemical sales days WAY in the past. Thanks for the note. I did not see myself doing this 20 years ago. But, here I am. Good memories of you, Rob, Paul, Ralph, and Carline. Keep sending comments. She looks beautiful. 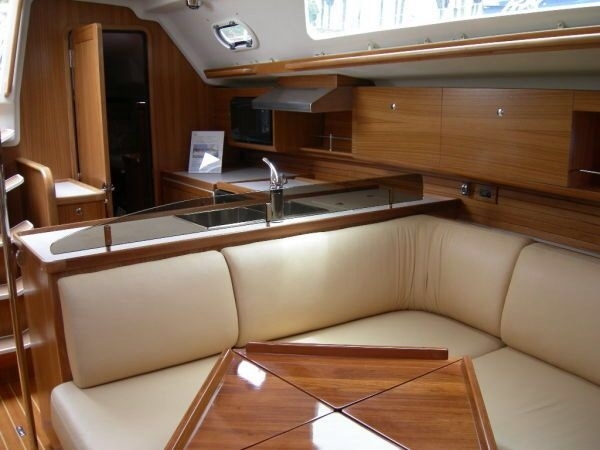 We are looking at a yacht with a similar keel – we like the shallow draft as we want to cruise through the French Canals. Just curious to how it performs upwind and offshore? Do you think there are any disadvantages? Thanks so much and I look forward to following your adventures! Not sure. Frankly, we don’t care about speed. We want a keel thst will allow us to anchor comfortably. Thanks for your comments. What a beautiful boat. Safe travels. Those beds aren’t long enough for Joey!! Ha-ha, sweet dreams!